Mexican food and I have often been at odds. I rarely partake of the cuisine outside of Texas, but the Jackson threads on Chowhound have been lit up with talk of Taqueria La Guadalupe. Always looking for something new and delicious in Jackson, I decided to strike a truce with Mexican food and give La Guadalupe a try. My friend Jenny was in town, and after picking her up, we headed over to the junction of Old Canton and County Line. Like seeing a dim sum restaurant full of Chinese people, it was a good sign when the parking lot at Taqueria La Guadalupe was full of Latinos. I have to apologize in advance. I brought along my camera case, ready to take pictures of cheap and tasty Mexican food, but I left the damn camera on my nightstand. So I’ll have to make do with iphone pictures. 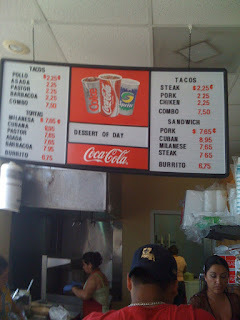 As soon as you walk in, you come face to face with the menu at La Guadalupe. With everything under $10, this place is pretty easy on the wallet. 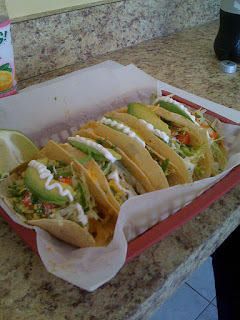 Having skipped breakfast, I was hungry, so it seemed perfectly reasonable to order one of every taco. And at only $2.25 a piece, it was financially reasonable as well. Working from left to right, there are chicken, barbacoa, tongue, pork, and tripe tacos. That’s a lot of variety for one lunch. 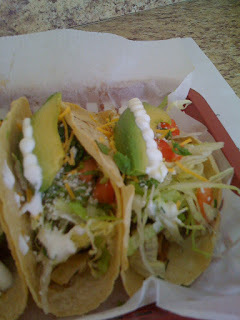 To begin, I was more than impressed with how each taco was dressed. Underneath all that fresh vegetation was a fair amount of meat for each taco, and I was more than impressed when I saw the avocado was sliced to order. Starting with an unknown seemed a good idea, so the first taco I tried was the tripa (tripe). I expected a very chewy meat, instead I found a taco full of tasty and crispy morsels. The pork taco was a little bland, but all was remedied with the application of a little lime juice. Moving to the second odd ball, I wasn’t sure what to expect with a tongue taco, but I was pleased to find the tongue to be slightly chewy but very well cooked and delicious. After the tongue taco, my taco supply was quickly dwindling. Luckily the barbacoa taco was next and it was the best of the five. I tried some of the meat by itself and I was positive that the barbacoa was the best of the five meats. 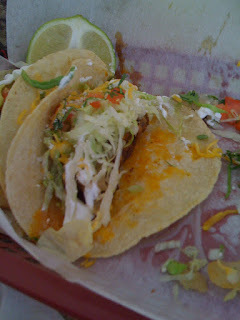 Lastly, the chicken taco was a pleasant way to end the meal. The meat was moist and extremely well seasoned. You need a good drink to compliment the various flavors in all of La Guadalupe’s tacos. 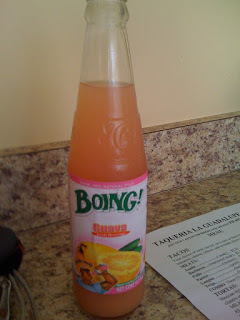 I tried the Boing guava, and I was hooked. It might have been a little sweet at first, but this guava drink was addictive and was perfect for washing down the multitude of flavors. 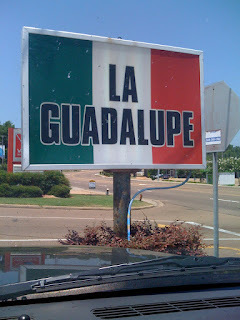 After my plate was clean, I only wished that I had tried Taqueria La Guadalupe sooner. The service was excellent, the staff extremely polite and helpful, and everything was very clean and orderly. Wanting to give my coworkers a taste of La Guadalupe, I took a bag of chips and salsa back to the office. Needless to say it was gone in minutes. The next day, the entire front office got lunch from La Guadalupe. Thanks, Andrew, for tipping us off to this. Great stuff. We hit it Friday, Saturday, and Sunday. BTW, you need to try Tweetdeck on the PC. Great interface.